Theatron is a Software as a Service solution - meaning that we take care of the installation, updates, training, daily customer support and back ups of your production data. This enables you to concentrate on the producing itself and making great theatre! Theatron is easily adaptable and grows together with your organization. With Theatron you are able to manage artistic, technical and administrative personnel in a way that fulfills the unique needs of each person group. You manage all your venues and various spaces, plan all the events that take place - from premiers to yoga classes and from visiting shows to detailed tour schedules and so on. Theatron manages your venues and spaces. You create all the needed spaces under each venue and define how each space is managed and handled during the planning. Stages, rehearsal rooms, foyers, meeting rooms can all be included and managed. You only need one Theatron environment, no matter how many venues and spaces you are running. Roles and casts can be easily created and managed for each production. 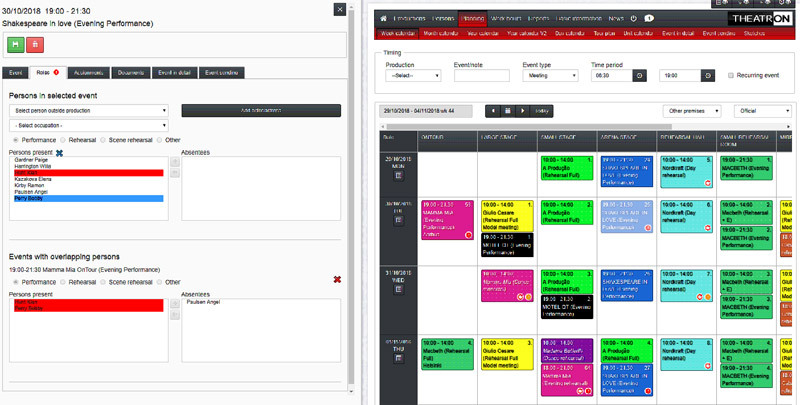 Actors can have make-up times before and after the show, you can create detailed rehearsal schedules and Theatron automatically checks that you don’t double book any of the artistic staff. For late changes in artistic schedules Theatron can automatically send an SMS alarm to the artistic staff notifying about the change. Technical personnel’s work days can be planned as detailed as needed and you have a live visibility for each person planned works, planned work hours on a weekly level, planned days on monthly level, planned work days per season or year and so on – making it easy to follow and plan the work ahead. If you do not wish to create detailed schedules for technical personnel, you have the option of automatically attaching person groups into events with the click of a mouse. Theatron adapts to your planning requirements. You yourself create yourself the event types that you want to plan and define how each event type is handled in Theatron. You are able to manage all the events that take place, performances, rehearsals, meetings, visiting performances, classes, room rentals and so on. Theatron also enables you to plan your tours as detailed as needed and also create detailed rehearsal schedules. There are planning calendars available for example daily, weekly, monthly, yearly, tour, department, holidays and reservations planning. All the calendars are connected and use the same centralized planning calendar, but separate views make it easy and efficient to manage different types of information. Theatron digitalizes your production planning process out of the box. But it also offers you a selection of optional features and functionalities from which you can choose the ones that answer your planning needs and match the level of automation you are aiming for. These options can be installed into your Theatron environment at any point, so that your Theatron adapts to your changing and growing needs. Through Theatron API you can transfer information between any third-party solution. If this is not enough, we welcome the opportunity to discuss the development of customer specific features for you. We offer a wide range of possibilities for sharing the always up to date schedules from Theatron. The iCalendar is a standard that works with any standard calendar software like Google Calendars, Microsoft Exchange or Office365. You can create different iCalendar feeds in Theatron and share the feeds with your colleagues, who can then use the feed in their computers, tablets and mobile phones. 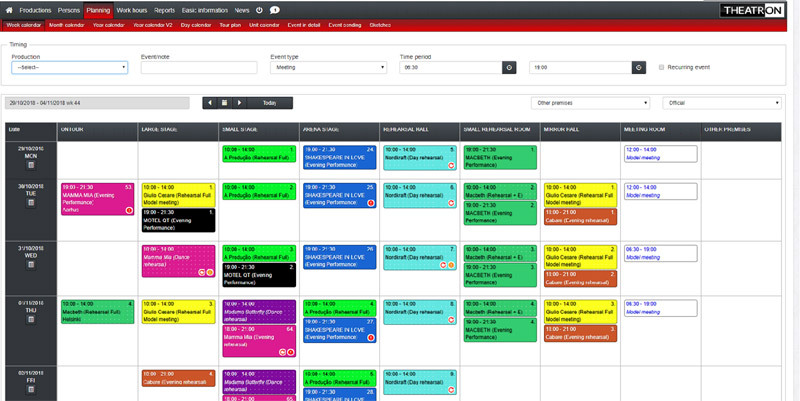 You are able to choose the productions, work hours and/or rooms for each iCalendar feed, allowing you to create a unique and purposeful calendar feed for each user group. You can also send schedules directly from Theatron via email. Info TV views for foyer and personnel entrance screens, and of course a comprehensive set of printable reports are available. 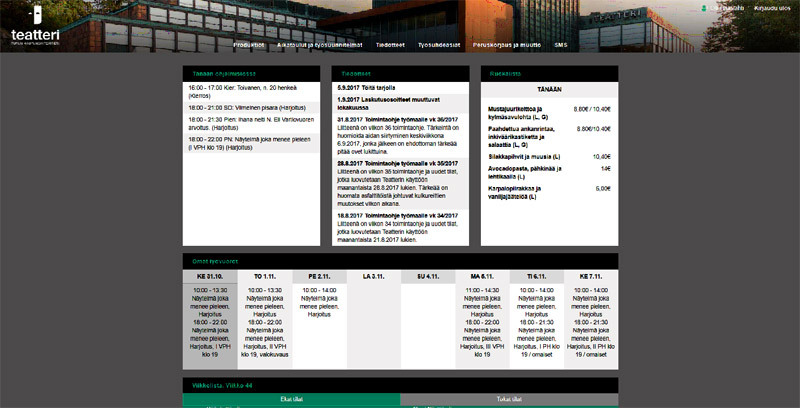 Our most popular option for sharing the schedules is the Theatron Intranet. It brings you all the schedules from Theatron accessible from anywhere with any device for all the employees. Each user can check their own planned work schedules, artistic personnel see their detailed rehearsal schedules, week lists, monthly and yearly plans can be published and so on. 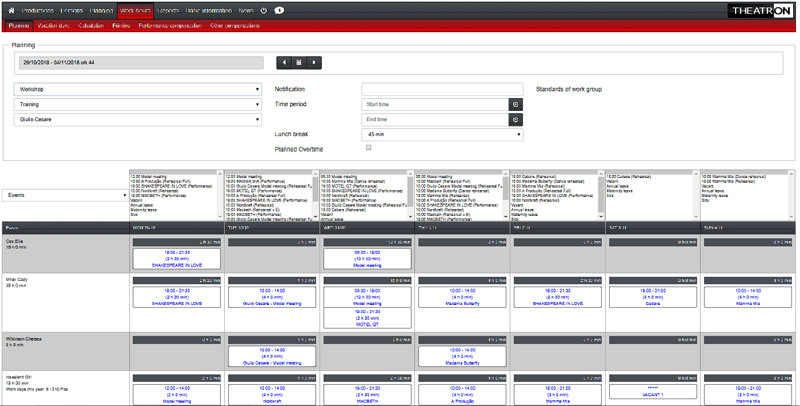 The Intranet is integrated automatically into Theatron, but you are able to create more content into it yourself. Job healthcare, job safety, personnel manual, employee contact book, image galleries can all be included in your Intranet. It is easy to add and manage the content with a standard WYSIWYG (what you see is what you get) editor. Each Intranet is tailored according to the customer wishes, applying the customers graphical guidelines. There are also a set of optional features available for the Intranet from which each organization can choose the ones that benefit them. You can send group SMS messages, manage the intermission table, drink/snack reservations and so on. Intranet also provides you a module for checking and accepting the work hours planned in Theatron, eliminating the print out and signing process for work schedules. Through Theatron API (Application Programming Interface) it is possible to share schedules for you existing Intranet such as Microsoft SharePoint. We would also be happy to hear your needs and ideas for developing the Intranet even further! Even though Theatron is a comprehensive solution it is still always possible to integrate Theatron into third party systems. Most common integration is integration into Human Recourse (HR) system allowing you to bring all the personnel from HR system into Theatron automatically. Theatron updates the changed information automatically once a day, so new employees are added automatically and persons whose employment has ended are passivated automatically in Theatron. Theatron is possible to integrate into the organizations access control system. This is usually done so, that the time stamps are brought from the access control system into the Theatron Intranet work time check/acceptance module for reference information. Theatron API is a standard based interface for both import and export of information between Theatron and third-party solution such as ticketing, payroll, inventory or any system that the customer might wish to transfer information to/from. Theatron has its roots in a production planning software which was originally created for the Finnish National Opera in 2005. The theatre version followed shortly afterwards, in 2006, as it was initially developed for the Finnish National Theatre. Currently Mansoft serves some forty theatres in seven countries and keeps winning new customers with its well received solution. Through close collaboration with its performing arts customers, Mansoft is able to develop Theatron services further year after year. Mansoft was established in 1993 and is based in Turku, Finland.